Paris We have a big, diverse and significant delegation traveling with the Organizers’ Forum for our 10th International Dialogue, this time in Cairo. We are all in the air moving across the time zones now with great anticipation to meet with our counterparts and get a sense of the social changes and revolution everywhere in the streets of the city now. For me it’s a relief to finally on our way, because navigating the details of housing, transportation, and the agenda for the program itself has been wildly difficult this trip. At one level that is exactly as it should be. Who has time for 22 visitors wanting to hear all about it with our million questions in the middle of a revolution? We get it…there are more important things to do! At the other level the difficult lies in the very uncertainty of these times for activists and others. The election is now set, but there are also tensions everywhere around the role of the military, the emerging political formations, and whether or not activists themselves are being targeted and in danger. This general concern is coupled with added strains around the role of the United States in the Middle East, especially Egypt, at this historic juncture. Whatever hand the US might have had, was hardly played well. First, Secretary of State Hilary Clinton was widely quoted as lining up with the Mubarak “stability first, rights second” team and arguing in the middle of the revolution for the status quo, which significantly downgraded our standing. Then after an 11th hour reversal of field by President Obama that seemed more opportunistic than anything else, we joined the winning team only to embarrass ourselves almost immediately as the dust cleared by offering $40 Million in money and attracting long lines of NGOs and others to some kind of weird, ham fisted effort to try and buy a seat at the table. Now while tensions are huge between Egypt and Israel over a recent killing of Egyptian soldiers, which is unraveling years of an alliance, we have the issue of Palestinian statehood and Obama’s threat to veto that at the UN Security Council to contend with as well. Let’s just say that I’m wearing my ACORN Canada t-shirt to fly into the airport! And, all of this makes it more difficult for organizers on the ground to weigh whether or not a meeting with our delegation of Americans, Canadians, and Italians is the smartest idea or whether they should find a conflict on the calendar. Nonetheless, our schedule will end up packed and exciting even with this as a backdrop. Just being there alone will be worth the price of admission to this Organizers’ Forum dialogue. How often do any of us get to be anywhere nearby the ground level of massive social changes in our lifetimes, must less game changing revolutions? With hard work and great luck many of us never have the opportunity and only the most fortunate can count the times on one hand, but all of us will have the experience now. Case in point: Within hours of our landing several unions have announced strikes around both political and economic issues including health care workers and teachers. Our first day we will get to witness the strikers rallying in front of the Cabinet building in the new tradition of the mass action in Cairo. I hope to be able to report while we are there, but I already know there are internet issues and potential problems. We’ll see what we see soon! 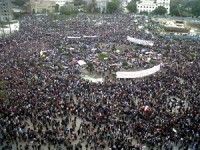 This entry was posted in Organizers Forum and tagged Cairo, democracy, Egypt protests, Organizers Forum by wade. Bookmark the permalink.